LAS VEGAS--(BUSINESS WIRE)--Shoptalk Booth #AI-5 – In its latest email marketing study, Coherent Path uncovers how effectively retailers interact with shoppers in the 45 days after they make their first purchase, compared to how they interact with non-purchasers on their email lists. 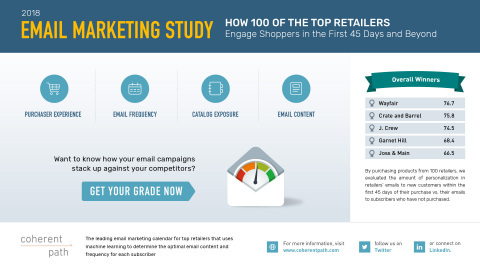 The report, “2018 Email Marketing Study: How 100 of the Top Retailers Engage Shoppers in the First 45 Days and Beyond,” also includes an evaluation of Email Frequency, Catalog Exposure and Email Content for non-purchasers. Of the100 top retailers evaluated, Wayfair scored highest with 76.7 out of a possible 100 points across all four categories. To obtain this data, Coherent Path worked with MailCharts to purchase products from 100 top retailers and evaluated the emails they received over a 45-day period vs. those messages sent to a non-purchaser during the same timeframe. One of the most shocking findings in the evaluation is that retailers are not personalizing their purchaser emails. In fact, 62% of the time, retailers sent the exact same email on the same day to the purchaser and non-purchaser, and only 26% of all emails were unique to the purchaser, despite having clickstream and purchase data to leverage. Wayfair scored highest among all retailers because they personalize a majority of their email, with 71% of the emails sent to the purchaser being unique to them. In addition, 50% of their emails contain categories in the subject line and 54% of emails have a subject line that matches the email content. When it comes to frequency, Wayfair doesn’t bombard shoppers with emails; in fact, they only send more than one email a day 17% of the time. When it comes to the Purchaser Experience, Levi’s was the exception in the study. During the 45-day timeframe measured, more than 75% of the emails Levi’s sent to the purchaser were unique. Only 8% of the emails matched a non-purchaser email sent on the same day, and Levi’s reduced the amount of discount language in their purchaser emails by 75%, compared to those sent to non-purchasers. “It’s apparent that Levi’s understands how engaging a new customer with compelling, relevant content, rather than bringing them back with a discount, is a smart strategy to grow customer lifetime value,” added Glover. Email Frequency : While email is a tried and true marketing tactic, many retailers are sending far too many emails. Of the 100 retailers evaluated, Williams-Sonoma had the highest average email sends per day at 3.14. Pottery Barn, The Shopping Channel and Victoria's Secret sent two emails a day more than 90% of the time. Ballard Designs and Free People earned a perfect score for sending an average of .96 emails a day. On the days they sent an email, 96% of the time, they only sent one message. Catalog Exposure : Exposing product catalogs and subcategories in email campaigns is an easy way to remind shoppers of all the types of products you carry, yet it’s one of the areas where there’s a lot of room for improvement. Retailers only mention categories in their subject line 20% of the time and subcategories only 17% of the time. It would take Health & Beauty retailers more than 16 years to expose their entire product catalog to a non-purchaser, compared to just 1.3 years for Apparel retailers. Victoria’s Secret, Nike and Ann Taylor performed well in this section for taking less than .66 years to expose their catalogs. Email Content: The biggest area of improvement in Email Content since Coherent Path’s last report was in mobile optimization. The use of discount and promotional language also decreased. 37% of all emails were optimized for mobile vs. 17% in the last evaluation. Sixteen retailers (16%) had a perfect score and optimized their emails for mobile 100% of the time, an increase from just 3% in the last evaluation. While this is encouraging to see, 63% of emails are not being properly optimized for the channel seeing the biggest usage gains in digital commerce. Discount or promotional language was used in 39% of all emails, compared to 43% in the previous evaluation. Health & Beauty and Home Goods & Furnishings retailers have the highest use of promotional language (51% and 48%, respectively). Four retailers – Frontgate, Lands’ End, West Elm and CVS – mention a discount or promotion in their email subject lines more than 75% of the time. The full evaluation, which can be downloaded here , includes the top five brands in each category – Purchaser Experience, Email Frequency, Catalog Exposure and Email Content. In addition, the report offers guidance for retailers looking to optimize their email marketing programs. Retailers are encouraged to use the Coherent Path Email Grader to get a custom report to identify where their email program is hitting the mark and where there’s room for improvement. Click here to get your grade. Coherent Path is the email marketing calendar company for top retailers seeking to transform their email program into a modern data-driven channel focused on revenue. The company’s machine learning solution empowers retailers with the relevant themes and categories they should feature in today’s campaigns, while continuously learning to inform the campaigns of tomorrow. By creating an optimized email diet that caters to each customer’s evolving tastes and moods, Coherent Path helps retailers quickly engage and cross-sell customers and promote strategic product categories while reducing email fatigue. Headquartered in Boston, Mass. with offices in Toronto, Coherent Path works with retail leaders including Neiman Marcus and Staples. For more information, visit www.coherentpath.com , follow us on Twitter or connect on LinkedIn . New Coherent Path study uncovers how effectively retailers interact with shoppers in the 45 days after they make their first purchase.